No salvage/residual value is expected. The company’s cost of capital is 12%. Compute discounted payback period of the investment. Is the investment desirable if the required payback period is 4 years or less. 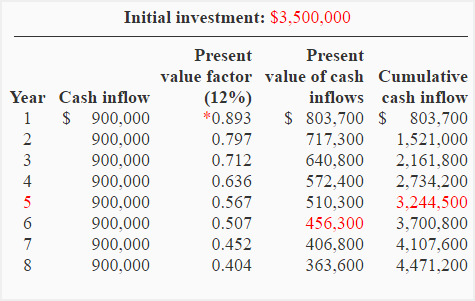 In order to compute the discounted payback period, we need to compute the present value of each year’s cash flow. 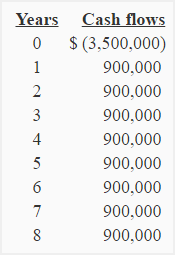 *Value from “present value of $1 table”. Because the discounted payback period is longer than 4-year period, the investment is not desirable. What is the difference between simple payback period and discounted payback period? Which one is the best? in calculating discounted payback we consider time value for money, we caluculate present values for all given future values and then we calculate cumulative values for those obtained present values. Simple payback period method does not considers the time value of money whereas discounted payback period method does. Both are used to analyze capital investments but discounted payback method is sometime preferred by managers because it takes into account the time value of money.